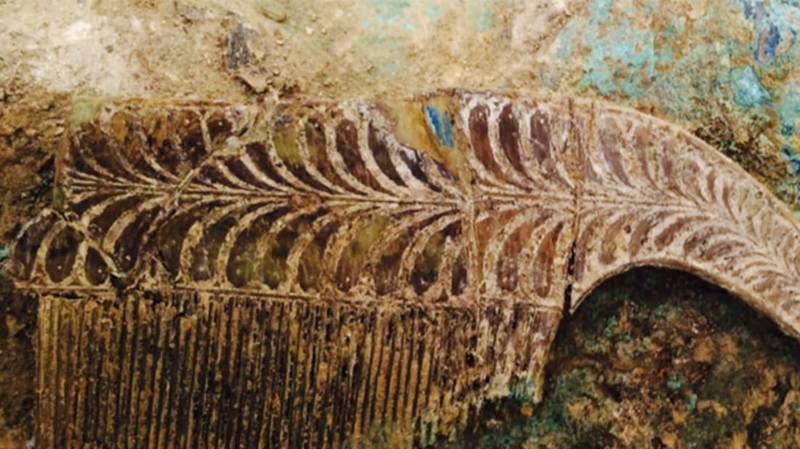 Archaeologists in southern Greece have uncovered the tomb of a wealthy Bronze Age warrior dating back to around 1500 BCE. The tomb includes not only the warrior’s skeleton, but also 1400 artifacts ranging from bronze swords and daggers to gold jewelry and precious stone beads. The University of Cincinnati-led archaeological team is calling it one of the biggest finds in mainland Greece in 65 years. The dig began inauspiciously: the team, who had been excavating the area around the Palace of Nestor at Pylos, chose to survey a nearby field, and soon found a few deliberately-placed stones. Researchers believe the tomb may help shed light on the emergence of Mycenaean civilization and the roots of classic Greek culture, which arose in that area several centuries later. Though the tomb pre-dates the Palace of Nestor (which was, itself, destroyed in 1180 BC, around the time of Homer’s Troy) by 200 or 300 years, it provides valuable clues about the emergence of culture and trade in that region. Together with other recent finds, like the Mycenaean palace near Sparta, the researchers believe they can start to piece together a more complete picture of the origins of Mycenaean civilization, which was the first advanced civilization to emerge on the European mainland.